The Kansas City Royals have been a long-standing tradition in the town where the Kansas and the Missouri Rivers converge. Additionally, this Midwest town is known for its close family-knit ties and its all-American values. 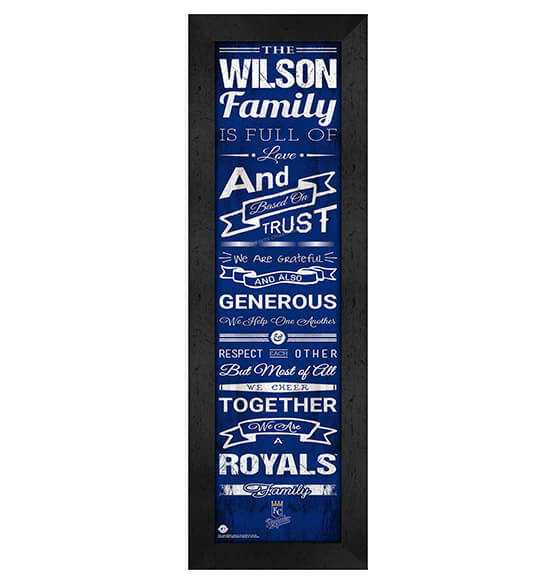 Celebrate all of what this area cherishes by combining your love of the Kansas City Royals and your love of family with our Personalized Family Cheer Custom Wall Art/Sports decor. It features the vibrant team logo and team colors, and a vertical-hanging design that features heartwarming family sayings. Perfect for the die-hard MLB baseball fan, this gift is one they'll cherish for many years. The included sawtooth hanger allows easy mounting.